Tri-Star Industries is a manufacturer and supplier of rust-resistant nuts, bolts and other fastening solutions designed for use in oil and gas, power and petrochemical applications worldwide. We provide an array of DNV-approved cathodic protection (CP) and pipeline inspection services for organisations operating in marine locations, which help preserve and safeguard the structural integrity of offshore assets and machinery. As well as being a highly economical solution, MASTERCOTE parts are also resistant to most acidic chemicals, remaining undamaged even when exposed to hydrogen sulphide at temperatures up to 121°c at 2,000psi. We stock an extensive list of U-bolts, stud-bolts and foundation bolts in a variety of materials, ranging from heavy-duty carbon and stainless steel to more niche and specialist alloys. We design and engineer customised fastening products to address clients’ specific needs and requirements. Load-indicating variants are also available. 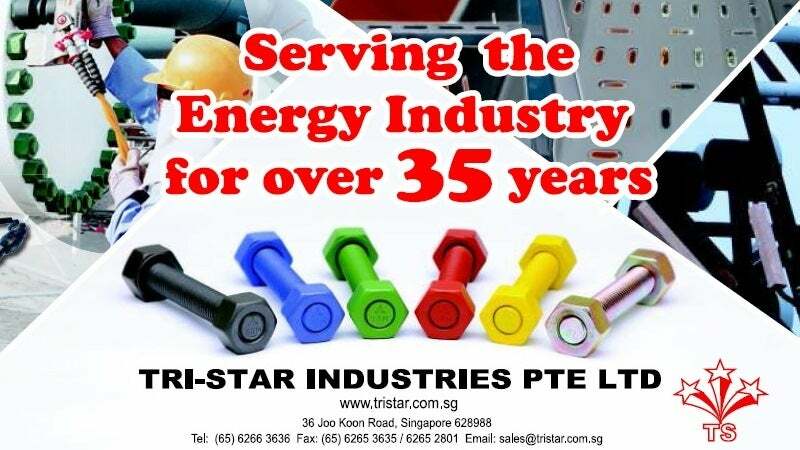 Tri-Star Industries is a trusted name in the offshore and petrochemical sector, currently holding a global Enterprise Frame Agreement with Shell Global Solutions for all its fasteners requirements. Alloy Technology, a wholly owned subsidiary of Tri-Star, is a specialist provider of critical, pressure containing fasteners to the subsea and LNG equipment manufacturers. It is the first and only company in Asia to be accredited by API to use both the API 20E and 20F Monogram. Tri-Star’s dedicated team of NACE-certified engineers specialise in the design, commissioning, supply and installation of sacrificial anodes and impressed current cathodic protection (ICCP) systems in marine environments. Our solutions are Shell International Exploration and Production Inc. (SIEP) and DNV Type approved, and can be easily retrofitted with existing structures and pipeline networks. Tri-Star’s hard-wearing, NEMA VE-certified products are manufactured from stainless and carbon steel, and galvinised via hot-dipping processes. Our complete catalogue includes a number of ladders, trays, trunklings, channels and concrete inserts, as well as cantilever arms, trapezes, cleats and various related accessories. Ladders are available in more 6m continuous run lengths on request. Many items in our product range are available in a number of epoxy, aluminium and FRP-GRP composite finishes, and contain fewer joints and fittings than many similar products on the market, reducing both the time and cost needed for installation. In addition, we provide consultancy services relating to the installation and bespoke design of our products. Tri-Star Industries supplies quality subsea and topside tensioner solutions tailored to customer specifications, designed and manufactured in-house by its committed and accomplished team. We offer our tools and products on both a purchase and rental basis, and can also provide ground staff with extra help when conducting complex operations on-site. Our experienced on-site service and commissioning crew is fully trained in the safe application and execution of our products and procedures. Additional personnel-based services offered by Tri-Star Industries include an array of leak-proofing troubleshooting and solutions, as well as flange management and joint integrity consultancy. Tri-Star Industries’ track record of excellent services spans more than 38 years, having grown to become a leading supplier of anti-corrosion products and solutions worldwide. The company operates ten manufacturing and distribution facilities in Singapore, Malaysia, Indonesia, Korea, China, the Middle East, Australia and the US. Tri-Star Industries is pleased to announce that the company will be exhibiting at the Offshore Technology Conference (OTC) 2018. Tri-Star Industries is pleased to announce that the company will be exhibiting at the Abu Dhabi International Petroleum Exhibition and Conference (ADIPEC) 2017. The DIMET brand is renowned worldwide for its high-performance protection of offshore structures and pipelines over the last 50 years, having been active in the Asian cathodic protection field since 1970 after originating in Australia. Tri-Star Industries is pleased to announce that the company has been awarded a global enterprise framework agreement with Shell Global for the supply of studbolts and fasteners, which will run for a period of five years. Tri-Star Industries Pte Ltd is pleased to announce its patented Swift Torque® hydraulic torque wrench system, which combines the latest in innovative materials and technologies to create a versatile tool that is both lightweight and durable.